Lucy Mother and Child Care (LMCC) is an indigenous organization founded in September 1993. The main aim of LMCC is to provide pro-school education for children from low income families. The first project area selected by LMCC is a community living in the industrial zone of Addis Ababa, behind the Addis lyre Factory. It was observed that this community is situated in a very disadvantaged area, which is also highly polluted and many children are seen on the streets playing in very unhygienic conditions. This was substantiated by a survey, which clearly showed a multitude of problems. In the selected community priority was given to children who waste their precious time on the street instead of attending pre-schools or kindergartens. The concept of pre-schools or kindergarten is not popular in particular in poor communities in Ethiopia, be it in urban or rural areas. Children simply stay at home till they are of school age, as no child will be admitted to school under the age of seven. As a result such children do not perform well in elementary schools and many drop out of school and some end up in the streets. The first LMCC pre-school was established in September 1994, with an intake of 25 children, this number rose in subsequent years to 150, which was above the physical capacity of the center. 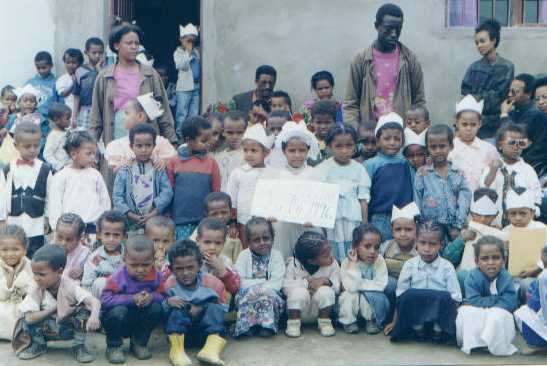 In September 1999 the intake was limited to 75 children. In Sept. 1999, a follow-up survey was conducted in the same neighborhood where LMCC has been operating since 1994. The result of the survey showed that most of the children who benefited from the LMCC Pre-school are now enrolled in primary schools. The first batch have reached the 5th grade. It was obvious from the survey that the drop out rate has substantially been reduced. Drop out was one of the problems observed during the first survey of 1994. For the new academic year, which started in Sept 1999, 75 children were enrolled. These children come from the surveyed neighborhood. Now the children could stay the whole day having enough time for playing and learning. The three teachers all recruited from the community have now more time to give due attention to the children. 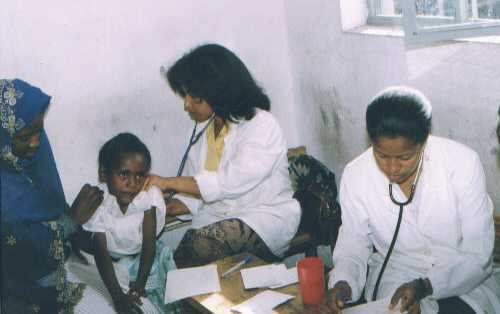 The annual general health check­up was conducted in March 1999 for the pre-school children with the help of three volunteer physicians from the Tikur Anbessa Hospital namely: Drs Kaleab Tesfaye, Habtamu Fekadu and Tsinuel Girma. Out of the 122 children examined, 29% (36) were found to be healthy with no clinically identified problems. The commonest health problem identified was intestinal parasitism, which accounts for 36%, followed by skin infections, 15%, eye infections, 11% ear infections, upper respiratory tract infections, dental cavities and xerophthalmia account for the remaining 12% of the total. The prescribed medicines were purchased partly by parents and partly by LMCC. One 7 year old female child was found to have seizure disorder and was referred to the Ethio-Swedish Hospital for further evaluation and management. It is also pleasing to note that all children were vaccinated against polio by a visiting medical team from the Ministry of Health. Another event of the year for the Pre-school was the evaluation of the program by a team of experts sent by the Addis Ababa City Administration. The purpose of the evaluation was to determine if the program has met its objectives. The team raised several questions for which it sought answers from the LMCC Coordinator of the Project. It also made several constructive suggestions. All in all the team was highly appreciative of what LMCC has done for the welfare of the children of the community and that it should intensify efforts also in the future. The team encouraged LMCC to forward its future plans and programs to the appropriate body. In 1999 some efforts were made to improve facilities for the reading room, which caters for older children. Many come on Saturdays to read and study at the center. With the help of one of the teachers some mothers have continued to show interest in knitting. An authorized accountant audited LMCC account of the years 1996-99. The auditors report and recommend­ations were approved by the Board. We would like to express our gratitude to groups and individuals who offered financial support to LMCC in 1999. As in the past years ETA (Ethiopians Taking Action) group in California USA: Amha and Sandra Habteyes, Asbe Kifle, Abraham Mekuria and Meseret Fanta, Mulugeta Arefeaine and Gultnesh Shifferaw, Meazah Tafesse, Molla Kinde and Wosene Kosrof raised US $ 390. EthCITA-EEDN members (through Dr Samuel Kinde) donated $729. Prof Borje Wickberg of Uppsala Sweden donated US $500. From Bruehl, Germany, a society called “Sankt Martins Ausschuss” that organizes children festival every year in November on Saint Martin’s day donated from their annual fund EUR 511.29. Dr Rolf Goeppel of Germany also donated DM 723.14. Dr Alula Pankhurst gave Birr 300 for purchasing books for the reading room. We are very thankful to all our donors and supporters of previous years, whose names appear in previous reports. Prof. Ermias Dagne (Chairman); W/O Tadelech Tadesse (Sec. ); Dr Yohannes Belete (Treasurer); Dr Alula Pankhurst and Ato Ananya Admassu. Full time employees: Welela Gulema, Belaynesh Fekadu, and Mulu Bekele. Account name & number: Lucy Mother and Child Care, A/C 60497349. Bank address: Commercial Bank of Ethiopia, International Banking Division, Fax: 2511 517822, Box 225, Addis Ababa, Ethiopia. Project Site: Addis Ababa, Woreda 19, Kebele 57 (Behind the Addis Tire Factory, Nefas Silk). Support us so that we can support others.